I LIKE this forum software. It has some very nice features. I appreciate that I can see what I haven’t viewed yet. Good to know you like it. It’s open source software(https://www.discourse.org/). After some evaluation, we decide to use this one. Very versatile and stable. ^ ^. We haven’t explored all its feature. we can create feature request to its maintainer too. so we open this topic, so our backers can tell us your requirement. The only problem I have run into is when I leave it open, it doesn’t log me off automatically, it just gives an error, then I have to log off and then log back in. It would be better if it just sent me back to the login screen. Or perhaps better than that, give the user the option to stay logged in for a longer or user set time. One feature that would be nice is a button in the tool bar that will take me to the next unread post. The pop down menu has a “Groups” item which basically leads nowhere. Have Groups not been turned on and what might their usefulness be? Also, are there Forum training features that aren’t turned on? Some of the “Badges” items references tutorials. I think you need to put some restrictions on top level topic categories. Otherwise your going to end up with a list of 100’s of topics and no easy way to find what your looking for. You should try to impose some order on the categories. Thanks for your feedback. @Rainie Already put restriction on some specific topic. And put restriction to different user level. For example, new user can only reply a thread and can’t post new thread. This can reduce dupliecate thread for the same topic. I tried to post new topic but the computer goes: NO! hello @whimsycwd, the idea of the forum is very good, it’s what creates a community. But why is it not possible to create topics? To see answer anywhere is to make this forum unusable. thanks. I wanted to ask a question about my printing bed and the time it should take to heat. I thought I would create a new topic about it and it will not let me. Is there a better way to ask a question like that? I think you need some kind of READ ME or “How to use the Forum” Topic. I see a lot of folks posting in the wrong places perhaps because they don’t know or haven’t learned how to navigate the forum and it’s features. Brilliant idea: All forums suffer from “noobie idiocy” and “i’m important so I’ll just do what I want” puffed shirts (who also often feign ignorance to excuse posting in the wrong place). IE: a tutorial on “how to search” and a Q/A quiz on how you might have searched for a specfiic topic, to be sure you know how. For example, I learned a lot after going to the “Badges” section and seeing just how one earns them. I also just learned today that the little round popup menu at the top-far right of the Top level Category lets you set what you get info fed back to you on. I think I learned that when I first started but then forgot about it. The forum has a structure, right. 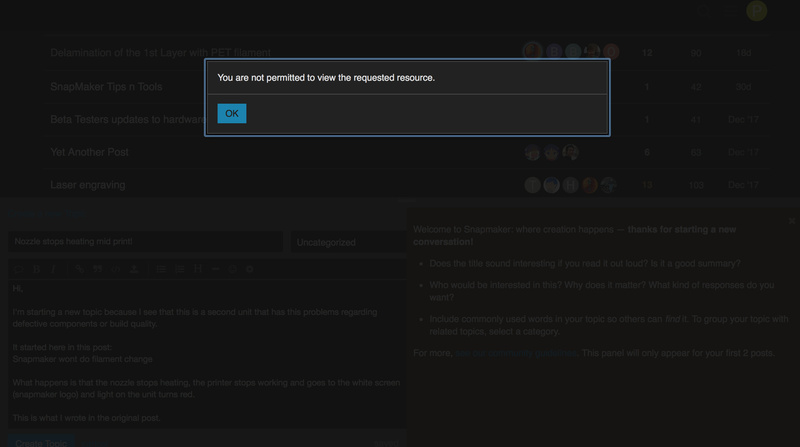 But the usability… Still today I’m not permitted to start a topic because of the authority levels. To gain levels isn’t explained anywhere. Also there should be categories like Open Discussion, Tips and Tricks for every member. I’m also not permitted to start a topic because of the trust levels. To gain levels isn’t explained anywhere. When you are in the BADGES section, you can click on the Blue Title and it will explain what is necessary to receive that badge. I believe I can create Topics because I have achieved the “Member” badge. Some of those explainations are perhaps not extensive enough. @Rainie, can we get a Forum Basics Topic created and some of these questions answered??? Fusion 360, where to start? You can follow our User Guide to try the 3 functions of the Snapmaker. Because there were some repeated topics created by new users, I changed the settings of the forum. Only level 2 users can create a new topic. To become a level 2 user, you need to hang around more and reply to some topics. Most of your questions are answered by other users, so have fun checking out all the topics! A “level 2 user” would be the “Member” badge. A good reference is the “Forum FAQ” section. What is the certified badge about? I can’t find anything related to that. Anyone have a link to the new user tutorial?